Last Friday, before heading out to see friends for a long weekend, I made the roasted ratatouille from my friend Gena Hamshaw’sFood52 Vegan. I chopped up every pepper, onion, eggplant, tomato, and zucchini I could find, threw them into my largest roasting pan, tossed them with olive oil, white balsamic vinegar, fresh thyme, and salt, and cooked them till they released their juices and melted into a stewy mix. 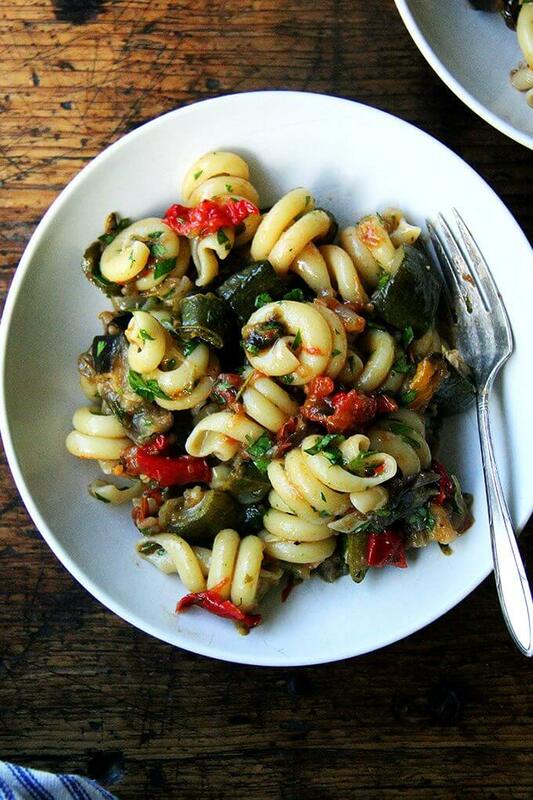 That evening, I tossed the ratatouille, as Gena suggests, with pasta, then packed up what remained for the road. My friends and I at the ratatouille all weekend, cold straight from the fridge for lunch, spread over grilled bread before dinner. What I love about this ratatouille’s flavor is the subtle bite lent by the balsamic vinegar, which evokes eggplant caponata though the sharpness here is more mellow. It is irresistible.